While I can’t afford Nancy Gonzalez’s python hobo—the perfect bag for this and all seasons—I found that the designer makes something cool and python that I can afford: a ring. 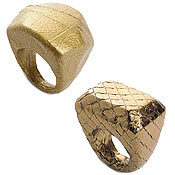 I’m into gorgeous, big jewelry and these fit the bill in a choice of gold croc or bronze python. Considering all the plain, black looks this fall, a loud accessory is a must. Not that I ever needed an excuse.